→Husqvarna 445 Chainsaw Review: Do All Homeowners Need One? Husqvarna 445 Chainsaw Review: Do All Homeowners Need One? For many homeowners, a reliable gas-powered chainsaw is an essential power tool to have close at hand. Trimming overgrown trees is a yearly preventative maintenance that can keep your property looking great. It will also reduce the likelihood of heavy tree branches crashing into your home during a storm. Even with regular trimming, stronger storms may knock over unhealthy trees with shallow roots. Here again, having a chainsaw is vital for cleaning up. We hope that you find our Husqvarna 445 review helpful in making your decision of which model chainsaw to purchase. Does this chainsaw come with a case or blade cover? What is the length of the bar for the chain? Should I be worried about shipping a chainsaw? Is it not going to break before I receive it? Does this saw come with a chain? Can this saw take a 16 inch or a 20 inch bar? Does it start easily for a woman? What is the starting sequence for a Husqvarna chainsaw with a cold engine? How do I start a chainsaw with a warm or previously run engine? Does Husqvarna provide a warranty? Chainsaws are also great for cutting your own firewood for winter warmth. With so many brands of chainsaws that look virtually identical, how can you decide which one meets your needs? 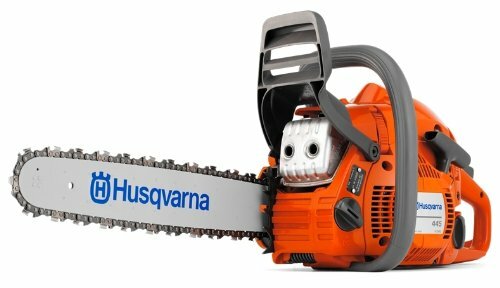 If you’ve been looking at chainsaws, you’ve probably come across the 445 Husqvarna. The Husqvarna brand is sometimes simply referred to as “Husky,” which is certainly easier to say, although it isn't pronounced like it reads, you don't pronounce the q, it's almost silent, so it is pronounced "Husvarna". Let’s look at features of the Husky 445 gas-powered chainsaw. Below you will also find answers to common questions, information about the warranty, and how to start the chainsaw depending on whether the engine is cold or warm. The chainsaw has a variety of features to make starting easy, reduce injury, and make the overall chainsaw experience more enjoyable. The 445 has a combined start and stop switch and fuel pump, which make the chainsaw easy to start. The engine and starter have been designed to start quickly with minimum effort. 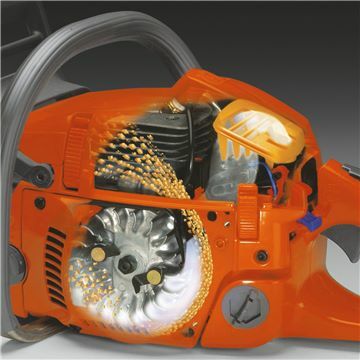 While gas mowers and trimmers usually come with priming bulbs, this is a newer feature for chainsaws. Priming removes air from the carburetor and fuel system and makes starting easier by reducing the number of pulls you need to do in order to start the saw. When priming your chainsaw in the start sequence, remember to push it in several times until you see fuel in the bulb. The bulb does not have to be full. A combined choke and stop control reduces the risk of engine flooding and simplifies starting and stopping the chainsaw. Cutting wood is messy. With all of the wood chips and sawdust flying around, it’s hard to keep the debris from clogging the air filter on a chainsaw. However, a centrifugal air cleaning system on the 445 prevents larger debris particles from even reaching the air filter. This reduces your need to clean the air filter and increases the life of the engine. While the air injection system keeps larger debris from clogging the air filter, chainsaws create lots of small dust particles too. The quick-release feature facilitates quick and easy cleaning and replacement of the air filter. This feature increases fuel efficiency and reduces emission levels to be compliant with even the most stringent environmental regulations. The increased fuel efficiency means you can do more cutting with fewer breaks to refuel. The reduced exhaust is beneficial for your health, too. Even if you wear a mask while using your chainsaw, the exhaust can still cling to your clothes, hair, and skin. This can wreak havoc on allergy sufferers. The chain tensioning device is mounted on the side, allowing you to easily make adjustments to the chain with one hand while holding the chainsaw with the other. When cleaning or changing the spark plugs, you can save time with the snap-lock cylinder cover. You have to admit, having easy access also makes it more likely that you’ll complete the recommended preventative maintenance. We all know it should be done, but actually mustering the effort to take care of it can often be another matter entirely. The crankshaft is made with three separate pieces for maximized durability. This allows the crankshaft to withstand tough jobs. This chainsaw includes a system that is designed to reduce vibration levels to the operator. Vibrations from the motor can make users tire quickly. Minimizing the vibration levels felt can reduce fatigue and help you keep cutting longer, with less muscle soreness later. The fuel indicator is transparent, making it easy to know how much fuel you’ve got left at any time. You can better plan your breaks. You also won’t have to worry about running out of fuel in the middle of cutting down a large and dangerous limb because you’ll know how much you’ve got before you start. This style of chain brake makes using the chainsaw safer because it reduces the likelihood of injury due to kickback. While a case is not provided, a cover for the chain is included. Cases are available on amazon, and a suitable model can be found here. The length of the included bar depends on which exact model of the Husky 445 you buy. The 966955336 includes a 16 inch bar. The 966955338 model includes an 18 inch bar. If this is your first chainsaw, be careful you know what size you are buying! The bar is measured by cutting length, so an 18 inch bar means there are 18 inches from the edge of the chainsaw body to the tip of the bar. If the bar is not installed on the chainsaw, it will be longer. Bars should always be measured when installed on a chainsaw. No. This chainsaw is packaged securely within its original retail box. When shipped, the retail box is then packed tightly within a heavy-duty corrugated box. Yes, this saw comes with either a 16” or an 18”, .325 pitch chain, depending on which model you purchase. It also comes with the right tool to tighten the chain. Since it can take a several days to get a chain sharpened, consider purchasing a second chain as back-up. A sharpening kit specifically for this model is also available. If you’re willing to take the time, sharpening your own chains can save you a lot of money in the long run. Yes, you can fit this saw with either a 16 inch, 18 inch or a 20 inch bar and chain. This saw has a pull start system, which does require some physical strength. The manufacturer provides an easy-to-follow starting sequence that is essential to getting the chainsaw to start frustration-free. However, if the chainsaw is still warm from prior use, it can be tricky to start even when following the directions. 1. Check to make sure the bar, chain, and all covers fit correctly. Remove the chain cover. 2. Activate the chain brake by pushing the front hand guard forward. 3. Set the choke control in the choke position by pulling the choke control outwards. 4. Press the air purge 5 or 6 times until fuel begins to fill the bulb. 6. Pull the starter handle with your right hand and pull out the cord slowly until you feel resistance. 8. Pull rapidly until the engine fires, or tries to start. Listen for a noise that sounds like the engine partially started, or fired for a few revolutions. This will usually happen in 2-3 pulls. 9. Push in the choke control and push in the decompression valve again. 10. Repeat pulling the starter handle until the engine starts. 11. Set the engine to idle by depressing the throttle lock and quickly increasing the engine RPMs with the throttle trigger and releasing immediately. 12. Disengage the chain brake before using your chainsaw. 1. Pull the choke control out and push it back in again. This will set the fast idle control. 2. Press the air purge at least 6 times, or until the bulb starts to fill with fuel. 3. Press the decompression valve to reduce the pressure inside the cylinder. 4. Pull the starter handle with your right hand and pull out the starter cord slowly until you feel a resistance. 5. Then, firmly and rapidly pull the starter handle. 6. Pull rapidly until the engine fires, or tries to start. 7. Set the engine to idle as soon as possible by depressing the throttle lock. This prevents unnecessary wear to the clutch, the clutch drum, and brake band. 8. Disengage the chain brake before using your chainsaw. 9. Stop the engine by switching off the ignition. The manufacturer provides a generous warranty period. For regular residential use, that period is 2 years. For any commercial use, the period is 90 days. Registering your warranty isn’t required for your warranty to be valid. However, for residential use, you can extend your warranty to a total of either 3 years or 4 years. ​1. At the time of purchasing a Husqvarna product, you need to also purchase at least 6 bottles of Husqvarna brand 2 cycle oil. You can find a 6 pack of this oil on amazon here. Both of these purchases must be on the same sales receipt. 2. You then need to register your product online. The registration form can be found here. 1. At the time of purchasing a Husqvarna product, you also need to purchase at least 96 oz of Husqvarna brand pre-mixed fuel. You can find a 96 oz pack of this fuel on amazon here. Both of these purchase must be on the same sales receipt. In order to be eligible for warranty coverage, you are responsible for shipping or hand-delivering your chainsaw to an authorized service center for any repairs. Fortunately, within the continental U.S. there are almost 4500 authorized dealers and service centers. Finding one within driving distance isn’t too difficult. Husqvarna has a dealer locator tool on their website to help you find the nearest service center, or you can always call them during regular business hours to get dealer and service center information. Just remember to provide a copy of your purchase receipt to the service center. The receipt should show the date of purchase, the product model, and the serial number. There are some limitations to the warranty. For example, you must take reasonable care of the chainsaw according to manual. This includes doing all of the preventative maintenance tasks, as well as using the correct amounts and types of fuel and oil. If you make any adjustments to the throttle cable or belt guides after the first thirty days of purchase, for example, it will also void the warranty. A separate warranty for the engine or transmission is available from their respective manufacturers, so this information will be provided with your purchase. The Husky 445 gas-powered chainsaw has plenty of power to complete most cutting jobs around the yard. The features of this model make it fairly simple to use. They also make it safer for those unfamiliar with using chainsaws. By following the recommended starting sequence, anyone with a just a bit of physical strength can easily and quickly get the chainsaw started. Husqvarna’s extended warranty offer is a reflection of their commitment to quality. For the price, the 445 Husqvarna chainsaw is a great value.